← London 2012, Men’s Bronze Medal Match: Australia 3-1 Great Britain. Jan Phillip Rabente’s two goals ensured Germany retained the title they won in Beijing four years ago with an impressive win over The Netherlands in an exciting finale to an excellent competition. The 25-year-old midfielder went into the tournament as one of only two Germans with an international goal tally in single figures; however his brace here tonight was surely the most important of his career. 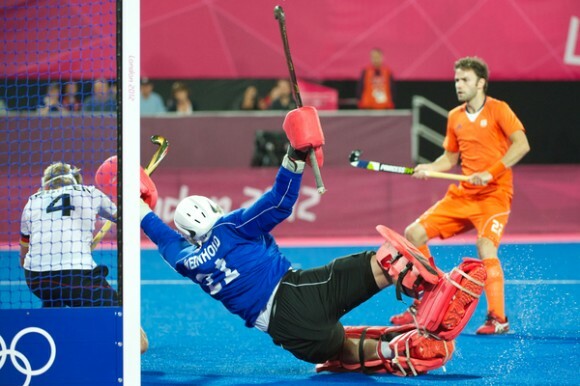 Both sides had performed brilliantly in the semi-finals: The Netherlands destroyed Great Britain by 9 goals to 2, whilst Germany despatched most people’s favourites, Australia with a powerful display, running out 4-2 winners. The game was fairly even in the first half. Rogier Hofman went close for the Dutch after an excellent run into the D. His scuffed shot almost caught Max Weinhold out, the goalkeeper expecting a much more powerful effort, but eventually scrambling the ball to safety. Weinhold showed no such hesitation later on in the half, acrobatically spreading himself to make a wonderful save from Billy Bakker who had been set up by Robbert Kemperman’s run. Germany showed their ruthless streak in front of goal in the 33rd minute. A splendid individual goal from Rabente, who cut in from the right flank, beating Sander Bart and Robin Van Der Horst before slapping the ball past Jaap Stockmaan and into the net. It was a goal that would light up any occasion, but particularly special to score it in the Olympic Final. Early in the second half, Florian Fuchs set up Christopher Wesley, but with the Germany No9 at full stretch his shot was easily repelled by Stockmann. Germany went even closer minutes later: Benjamin Wess did well to get round the back of the Dutch defence and cut the ball back to Matthias Witthaus. His first time shot beat Stockmann, but not the post, as it rebounded out and to safety. The Oranje threw everything they had at Germany in a bid to try and wrestle the gold medal from them. After a series of penalty corners, they had their goal: Mink Van Der Weerden gave Weinhold no chance with a powerful flick which beat the goalkeeper to his left and rendered Max Mueller on the line, helpless. It was Van Der Weerden’s eighth goal of the competition, announcing his arrival on the world stage in style. Christopher Zeller, who had thus far been fairly quiet, was kept out by Stockmann, but with five minutes left, Germany got their noses in front again. Rabente burst into the D and was well smothered by the Dutch defence. With the goal scorer behind the goal appealing for a foul, the ball was only half cleared. Realising this, Rabente took up a good position by the far post and was found by Tobias Hauke’s long pass, which he deflected home to give Germany the gold medal. The Dutch had the better of their opponents when the two met in the group stage, running out 3-1 winners. Germany had also drawn with New Zealand and survived a second half onslaught against Belgium. However, as is always the case on the big occasion, they always do what is required at the business end of a tournament. The Netherlands had given them a stern examination in this final, but in the end, Germany were well worth their gold medal. And so ended a superb tournament. Two weeks of pulsating hockey, great goals, wonderful defending and partisan support. If hockey is to be adopted and loved by the masses as much as some of us hope, London 2012 will have done that goal no harm at all.